1. This product uses high quality lithium-polymer batteries, high-efficiency voltage conversion technology. 2. With small size, high capacity, portable, safe and reliable for a wide range of characteristics. 3. Through different adapters, to give mobile phones, MP3, MP4, PDA, PSP, POD, digital cameras and other digital products added power, is your ideal helper away from home. Tell us what you think about 2014 fashion hello kitty portable power bank cute power bank with high capacity 8000mah, share your opinion with other people. 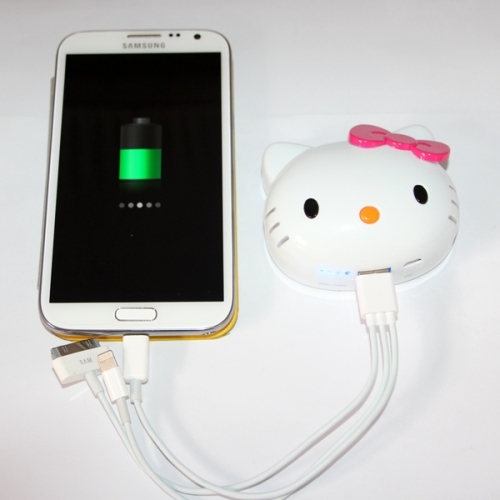 Please make sure that your review focus on 2014 fashion hello kitty portable power bank cute power bank with high capacity 8000mah. All the reviews are moderated and will be reviewed within two business days. Inappropriate reviews will not be posted.